OpenROV, the $750 BeagleBone Powered Mini Submarine « Adafruit Industries – Makers, hackers, artists, designers and engineers! 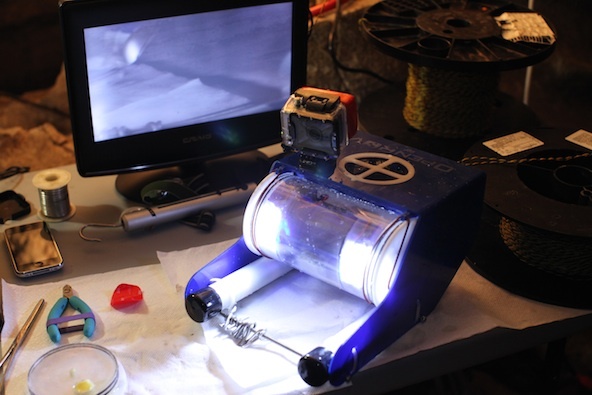 Brian Lam has a nice article in the New York Times today profiling the OpenROV project. OpenROV is a low cost submarine that will launch on Kickstarter later this summer for around $750. The OpenROV uses common parts to cut the cost. The depth sensor they plan to use is commonly found in a scuba diver’s computer. High definition video camera is scavenged from a cheap Web-camera that people use to video chat. The most expensive part inside is the computer, a little Linux computer called a BeagleBone that costs $89. Still, the team thinks they can get costs down by buying parts in bulk. The main body is a plastic tube where the computer, the camera, and LEDs are protected from the elements by the use of double rubber o-rings seated with silicone grease. A small hole sealed with epoxy allows power cables to pass through the end caps, and to the horizontal and vertical thrusters, as well as the battery packs. Controls and video are relayed using a pair of twisted copper wires like the kind used in old landline phones. The wires spool out like a fishing reel so the robot will eventually be able to reach 100 meters under water. Instead of being built in a factory, OpenROV’s chassis is constructed using laser cutter machines that Mr. Stackpole pays to use at San Francisco’s TechShop, a community tool-share and clubhouse for tech wizards and designers in the South of Market neighborhood of San Francisco. 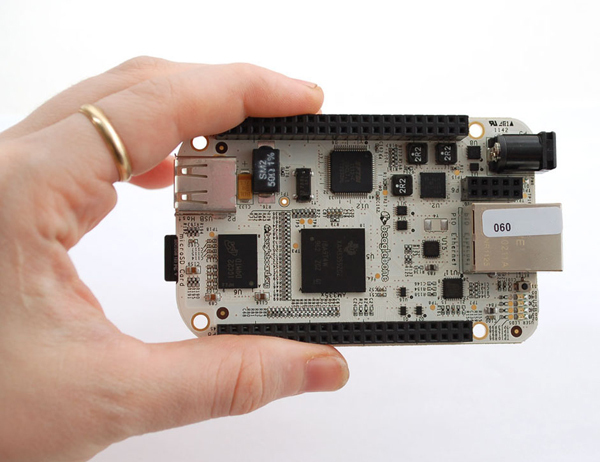 New from the fine people who have brought us the Beagle Board, we now have a smaller, lighter, but powerful single board linux computer, Beagle Bone! This is the same microcontroller used in the OpenROV project. We like this move to a more compact and integrated SBC. For example, there is onboard Ethernet and USB host, as well as a USB client interface (a FTDI chip for shell access). It even comes preloaded with Angstrom Linux on the 4 GB microSD card!